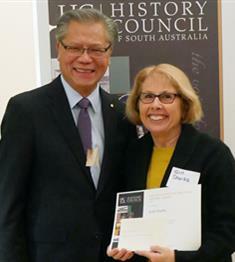 Huge congratulations to our member, Gill Starks, who in her role as Chairperson of the Tea Tree Gully Heritage Museum has won the 2017 Regional History award from the History Council of SA. The Museum is also known as the Tea Tree Gully branch of the National Trust. We all know what a marvellous team she leads but it is so nice to see her and their work recognised.